This is their full statement and call for support. ThyssenKrupp Atlantic Steel Company (TKCSA), one of the largest private enterprises in Latin America, has brought serious social and environmental impacts, with damage to health, environment and income of fishermen communities and residents of Santa Cruz in Sepetiba Bay, Rio de Janeiro, Brazil. Since 2006, social movements, non-governmental organizations, universities have been reporting in Brazil and other countries damages caused by this company. 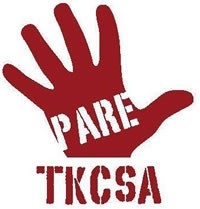 In an attempt to intimidate the free expression and to stop technical and scientific studies in progress, TKCSA sues for moral damages, Brazilian researches from public universities as UERJ (Rio de Janeiro State University) and Fiocruz (Oswaldo Cruz Foundation). First, TKCSA sued the researcher pulmonologist, Hermano Albuquerque de Castro from Sergio Arouca National School of Public Health (ENSP – Fiocruz). More recently, TKCSA sued Alexandre Pessoa Dias research professor of the Joaquim Venâncio Polytechnic School of Health (EPSJV – Fiocruz) and the biologist Monica Cristina Lima, from Pedro Ernesto University Hospital and board member of the Public University Workers Union of Rio de Janeiro State (Sintuperj). The last two lawsuits occurred after the disclosure of the technical report “Evaluation of social, environmental and health impacts caused by the setup and operation of TKCSA in Santa Cruz”. The document aims to evaluate, with technical and scientific bases, both environmental and human health impacts in order to guide future institutional actions of Fiocruz in Santa Cruz. Santa Cruz, the place in which TKCSA is located, is historically marked by the installation of large industrial plants, such as the Inga Mercantil. With a long history of human rights violations, it configures a kind of state of exception; in which rights and law do not apply. The licensing process of the plant was marked by suspicions. Nowadays, the company is under current investigation of a committee of the Legislative Assembly of the State of Rio de Janeiro in order to “inquiry possible irregularities and improvidence of the State Government and the State Environmental Institute (INEA), in providing the environmental authorization to begin construction of the plant”. In the phase of construction works, it was embargoed and fined by IBAMA. The company was also denounced by irregularities at the Brazilian Ministry of Labour. The environmental agency of the state government of Rio de Janeiro has notified and fined the plant several times for air pollution. TKCSA is subject of numerous civil suits. The prosecutor of the State of Rio de Janeiro has two criminal actions against TKCSA and their managers for environmental crimes. Nevertheless, the economic power and political influence of the enterprise still maintain the current violation of rights. The Presidency of Oswaldo Cruz Foundation, in a public statement on 01/11/2011, attested: “Fiocruz has as core value the freedom of individual expression (…) the legal action chosen by the company to deal with contradiction seems like a restriction on freedom of expression and generates institutional constraints on the official attempts to resolve the existent conflicts.” The UERJ University Council approved in December 2010, a motion repudiating TKCSA behavior. The Workers’ Union of Fiocruz (ASFOC-SN), the Association of Teachers of UERJ (Asduerj) and Sintuperj declared unrestricted support for professionals sued by TKCSA. The social movements, organizations, institutions, Brazilian citizens and foreigners, undersigned, repudiate the TKCSA behavior and proclaim unrestricted support for the professionals sued. We understand that these professionals were carrying out their duties as public servants when they defended the health of affected populations and applied knowledge to protect the public health. We are all Santa Cruz! Rio de Janeiro, 05th January 2012. The development of this situation was the murder of two of the fishermen activists, just after the Rio + 20 conference (see our news after June 22nd, 2012).